If you have ever wanted an insight into the lives of refugee children to see what they think and feel; here is the opportunity. These 25 stories told by children, are raw brave, and honest and pure as only a child’s voice can be. Painful at times, always evoking deep emotions, these delicate pieces of children’s lives are offered willingly to be shared with other children, and hopefully, to encourage tolerance and understanding in all people. The stories are not bedtime reading. They are tales of war, lack, loss and separation – of family, country, culture, and all that’s familiar. They are also about new beginnings, opportunity, and reunion amongst many other things. The illustrations are created with recycled and natural materials of all sorts upon earthy coloured pages of fine quality paper. 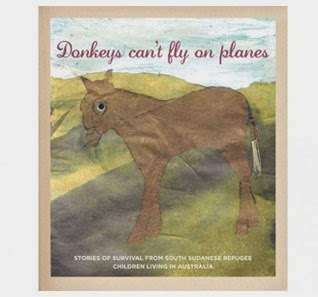 This book is wholly created by children for children, as are all books published by Kids’ Own Publishing.